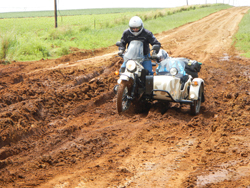 In South Africa we have a very passionate Ural dealer, Ryno Greeff, who loves Ural driving and therefore does it a lot and intensively. But Ryno also loves to share his passion with everybody and therefore frequently organizes Ural Meetings and Ural adventure travels in his closer or not so close environment. 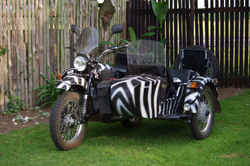 He very often sends us nice pictures and reports about their travels – he knows that he is keeping our desire for sidecar driving in South Africa cooking. 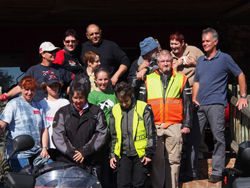 Following here are some pictures about the 2012 Sidecar Africa Convention in a small town called Clocolan. Ryno always keeps at least three Ural combinations available for rental. So there is no reason to not participate actively on his adventure travels. Chrissiesmeer, Kaapsehoop, Dullstroom - First Time Trippers Ride! The idea of a First Time Trip has been cooking for a while. 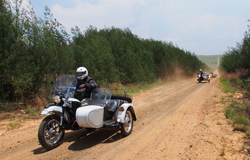 After the BIG Cradock to Cradock All Sexes Ride recently Sidecar Africa thought it the right time to do a shorter more relaxed and laid back ride to introduce some Ural riders, who are not necessarily so accustomed to riding their sidecars, to the fantastic experience of an Ural sidecar trip. I have secretly been plotting (maybe not so secretly?) to get to Kaapsehoop for quite a while now. The wild horses and some references have made me curious and when I stumbled across the whole Adam’s Calendar thing I was hooked – just had to get there doll. Chrissiesmeer was comfortably enroute and having read a few things about this part of the world was very keen to experience it before the whole of Sandton and Hyde Park got there! 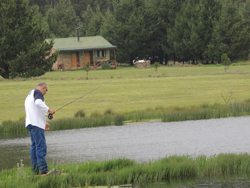 Dullstroom, well it worked route wise and more important – there is fishing in this part of the world. 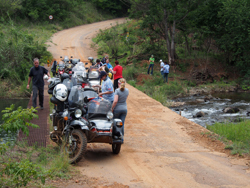 So long before we get to the fishing, let’s first pull away at Sidecar Africa in Hennopsrivier. If ever you want to see what happy smiles look like you must just come and hang around on the morning a trip leaves – the poster face of real joy! Lining up for departure were a fair number of the familiar faces (they just cannot leave a good thing alone) – Jude & Sheilagh with Leyla, Mike & Nikki with Alice (all newly painted resembling a kwagga), Raymond and Bronwyn with Verushka, Alpha & Klara and the super trusty Lola (she with the most miles on – hahaha!) and Ryno and Emma with Vlad the Glad! (nobody is allowed to use the word bad in Vlad’s company). Lining up for the First Time Trippers – Amanda with her gorgeous white Agripina. Elize and Hes on Griet (Liewe Heksie’s horse’s name – very clever) , Deon on the as yet nameless Gear-Up he rides and Zeta on Sputnik. Nine sidecars in all. Ryno did a rider briefing going into a little more detail to get everyone up to speed and we swung into the saddle with our first stop the Wimpy in Delmas. I had to smile as I overheard someone say: “You take the Rigel off-ramp and then it’s just dead straight to Delmas” – technically not the truth but I really got the drift as that is exactly what it feels like. One does not ride that first stretch for the fun – it is purely for the Wimpy burger and the knowledge that once Delmas is behind us the ride changes. With the Wimpy done and dusted we marched out of Delmas along side the pylons – over the mealie hills and we keep going till we get to the cloud factory at Matla. After that the landscape really picks up aesthetically speaking and soon I have John Denver squatting in my head and singing in my helmet again – what have I done to deserve this? Country Roads take me home wha wha wha whaaaa to where I once belong Wha Wha Whaaa……. Bethal put an end to that. I don’t think one should say too much about Bethal – having said that I hadn’t seen Breyten yet. What a shocker! 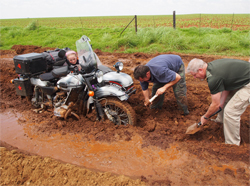 Between Bethal and Breyten Ry and Ems and Vlad came to a very muddy standstill. Of course this is met with huge excitement by everyone and a friendly farmer could not help himself – he just had to help. The long and the short of it was that Ryno was riding in the front and we were all riding on a recently graded dirt road and having graded the mud it made it impossible to judge how deep or not it was. Personally I was real glad it wasn’t us. Lola loathes mud as it is usually a stinky sticky business. Of course it was a brilliant opportunity for the riders on the Gear-Ups to take out the spades! Back in the saddle and we rode past places like Davel and Koringkraal. In no time at all we arrived at Chrissiesmeer where the wonderful people of St Cloud’s made us feel very welcome. We still had time to do the cemetery run and have a well deserved drink. Local lore (my monkey informed me of this) is that there is a grave of an English soldier who was killed during the Anglo Boer War and every year for the rest of her life, his fiancé would send money for a bouquet to be put on his grave to mark the anniversary of his death.) 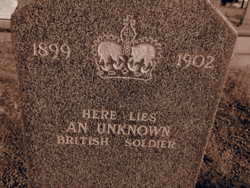 Also saw a head stone that reads “Here lies an unknown British soldier” and it just made me feel so sad. Nothing else about Chrissiesmeer made me sad – loved the whole little place, the people, their enthusiasm, the atmosphere, the scenery and the braai on Thursday night. Friday morning dawned magnificently beautiful (as most days riding sidecars are) and after a hearty breakfast we pointed our front wheels in the direction of Badplaas. Ryno had plotted a real lekker little route to get to Badplaas. Nothing strenuous, just gentle country riding to loosen up and relax into the day. In Badplaas we all fuel up for the next learning curve – turned out little more winding than anticipated as we had to make a detour through the informal settlement due to road works not indicated on GPS. Must say I loved it – saw some interesting sites and some very friendly people. Not sure who was more surprised, them or us? Finally we reached Msoli (a place we had visited the year before with Neil and Gary on our Badplaas weekend). It really is a very strange experience to drive through a town that had been abandoned but still looks if some of the people may be back just now. This time we didn’t have Nikki to lay on the brunch at the old Country Club so we parked on the bridge and entertained ourselves snacking and talking and just shooting the breeze. Next the riding would be getting a little more demanding and we were very lucky as the weather stayed fabulous and everyone seemed to enjoy the more technical dirt riding. We all popped out back on the tar on the R40 close to Oshoek. Descending from Oshoek to Barberton on this road keeps one on your toes or your tyres whichever you prefer. The road does not always bank correctly and the turns go from gentle to mean without warning. And so one of our riders was no longer on her toes or her tyres when the other riders came upon the scene. Everyone had a huge fright and the ambulance fetched the rider. I can report back that fortunately no bones were broken and no blood spilled but a knee gave way with some torn ligaments as a result. Although it was very painful for the rider and everyone had a huge skrik, we were much relieved once we received the news that she had not been seriously injured and were to be discharged from hospital the next morning. I have tremendous respect and admiration for this particular rider as she is an inspiration, and really really hold thumbs that she’ll ride again. 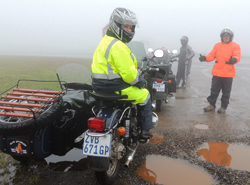 With all this going on we rode into Kaapsehoop with our spirits dampened. The weather did the rest of the damping – it started bucketing. 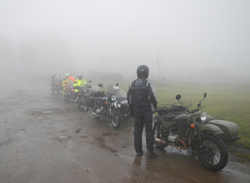 The last of the riders finally rode in just before the worst of the heavy rain. Like magic the said wild horses appeared in the mist like real ghosts – what a treat! Well the rain carried on much of the night and Saturday morning didn’t dawn – it just drizzled and poured. 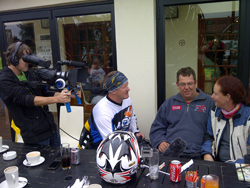 We also met up with the Woema people (as in the Afrikaans motorbike magazine and TV program). They would accompany us on the rest of the trip and Theunis would join us riding on Hari – yeah! Early early I already got a call from Enos our guide for Adam’s Calendar and the news wasn’t good. He didn’t think it would be worth going in this weather. We had special permission to go up there with our sidecars and now it wasn’t going to happen. Yours truly didn’t take this too well and sulked a little in her helmet. But as always, it turned out that life has a way of sorting itself out. Having stopped just outside Waterval-Boven to bunch up and get everyone on the same page again, I sulked a little more when I was told that we could not go and visit the Adam’s Calendar and Stone Circles museum in Boven. So I could see it but I couldn’t go – apparently I’m not always gracious when not getting my way and had the last bit of sulking between there and Farrefontein where we got off the big road (thank goodness) and back onto our dearly beloved country tracks. I was sulking so enthusiastically that old John Denver didn’t even start up! Sometimes I wonder about Vlad – I do think it’s personal. There must be a psychological term for people like me who believe inanimate objects and machines have it in for them? 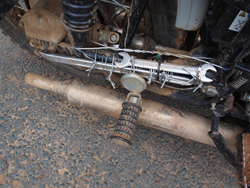 Approximately 5 kilometres onto the dirt Vlad’s swing arm broke – clean off. The final pothole had the last say. Also have to add the pothole would have been the last straw proverbially speaking as ole’ Vlad has done some serious riding with his enthusiastic rider. Enough sidecar flying and some serious Namibian desert riding to boot probably also added to this. Of course I had to eat humble pie and my words and my sulking – had we gone to the museum the rest of the day would have gotten real late. Now had we gone to the museum maybe the swing arm would not have broken? Hmmm. See these are the things that keep me awake in my helmet! Jokes aside, the swing arm was attached in a way the Russians would be proud of. With enough ‘blou draad’ and one of Kobus’ out of this world steel cable ties this too was overcome. I also saw a tyre lever and another spanner in the mix but hey what do I know I’m just a girl! n Boer maak n plan - which really has nothing to do with farmers and maps! Dullies here we come – now we were ready to eat all the pancakes at Harry’s Pancake Bar. Everyone had a real lekker lunch and we set off to Greystone Lodge. I was riding so happily listening to Louis Armstrong in my head that I completely passed the sign indicating the turn off to Greystone Lodge. I think I prefer Louis to John? Eventually also realised that I hadn’t seen any lights in my mirrors for a while and turned round. Sorry! The fishing rods came out and in due course the lines were being flicked across the surface of the trout dams. They tell me they did catch fish. .. It really was with a feeling of utter disbelief that I woke up on Sunday morning realising that yet again the time had flown. It felt like a heart beat ago that we started our journey and here we were saying goodbye again. Zeta had ridden on to become her own ... and our hero! Elise and Hes had a wonderful time (how fabulous to see 2 sisters sharing the adventure). Deon finally slept well and woke up feeling like he could ride all day and the ‘old’ riders felt like crying in their coffee because it was home time again. All I know is I have to get back to Kaapsehoop – I have some unfinished business there. So – watch this space!